Pick-Your-Own is now closed for the winter. Thank you for your patronage! Our market is open year-round, and pick-your-own will return in late May/June. Check back for updates. Drum on the pumpkin lightly and listen for a hollow sound. This means it is ready to be picked. If the pumpkin’s skin is hard when you press on it and almost feels like a shell, it is ripe. Look for a good amount of yellow-green leaves around ripe pumpkins. 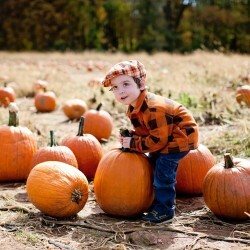 Find all kinds of pumpkin recipes on Pinterest and our blog. Please arrive at least one hour before closing time to allow enough time to check in and pick. When you arrive at the orchard, follow signs to the specially designated Pick-Your-Own (PYO) or U-pick fruit stations. Unless otherwise noted, there is no need to stop at the market first. We will show you where to pick, weigh any containers you brought, or you can purchase some of ours. We will offer some helpful hints if needed. When you are finished picking, come back to the station to weigh and pay. For apples, we give you bags and you pre-pay based on bag size—which means no waiting in line after you’ve finished! Pick-your-own fruit at Weaver’s is relaxing and kid-friendly, a chance to enjoy nature and pick sumptuous fruit. All of our apple and peach trees are dwarf trees, so most fruit will be within easy reach. Cherry trees are 80% dwarfs. We also close off rows that are not yet ripe, directing you to sections where you’ll find the best picking. We also mow and weed grassy areas to give you easy access to fruit. Please observe all rules for the benefit of all of our customers and our farm. Always check in at the PYO shed first to get picking locations and information. We recommend wearing close-toed shoes, as bees, hornets and yellow jackets may be present on fallen fruit. Please pick only in designated areas, which are carefully selected based on the ripening schedule of our fruit. Paring knives are not permitted. Do not climb or shake the trees. This will damage fruit and can break tree limbs. If two or three fruits are clustered together, use two hands and gently pick all the fruit in the cluster. If you drop any fruit on the ground, we ask that you please make every effort to pick it up and purchase it so that no fruit is wasted. Many labor-intensive hours go into the care of our crops. Please dispose of trash in proper receptacles. Please be considerate of all of our customers and observe our non-smoking policy. Visit Weaver's Orchard's profile on Pinterest. Monday-Friday from 8 a.m. – 6 p.m.
Saturday from 8 a.m. – 5 p.m.
Closed. Will re-open in late May/June. Christmas Eve: 8 a.m. – 3 p.m.
New Year’s Eve: 8 a.m. – 3 p.m.
Closed. Will re-open in spring.